The coming of the beloved one. Online Resource O great lover who pursues us (Richard Bruxvoort Colligan) Great new words based on this passage, sung to the familiar tune HYFRYDOL. Lyrics and purchasing options. *MV031 Pure Love (Linnea Good) I think this song would be good for reflecting on God as the source of all love. Very simple and beautiful. Good for kids. G(II)630 / GC867 / GC(II)860 / G(3)968 Wherever You Go (David Haas) Good words based on Song of Songs / Song of Solomon and Ruth. It would work well with a cantor, though I'm not sure how it would fit in a standard worship service (as opposed to a wedding). Lyric and sheet music sample. Slow, but nice sound sample. Tune in The God that I Know (Sheree Anderson) A beautiful ballad with female and male images of a loving, embracing God. Free downloadable song book, sound samples. Recorded Music Canticle (Clarion Fracture Zone / Mara / Martenitsa Choir) If you happen to have a recording of "Canticle" a jazz work commissioned by Paddington Uniting Church, first performed in 1997, this would be the time to dig it out and play at some point during the service. Available here. Sacred Harp Rose of Sharon (William Billings) This is not a suggestion for your congregation, but if you happen to have Sacred Harp singers in your area, go join in and see if they sing this (they probably won't!). It's one of the more challenging "anthems" and quite excellent when done well. Listen to them singing it in Ireland. 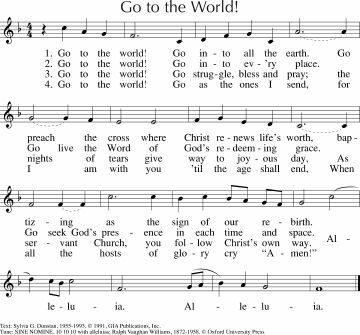 PfAS045B The throne of God is righteousness (Evangelical Lutheran Worship) A simple Psalm refrain to a familiar hymn tune (EIN FESTE BURG). *AoV2-068 / VU695 God is passionate life (Colleen Fulmer) Good simple round with a peace / justice focus. Good for kids. CH115 / MV089 / Iona (Love from Below) / A&M722 / SP292 Love is the touch of intangible joy (Alison Robertson) Great words and a simple tune. "God is where love is, for love is of God". Lyrics (scroll). SgTJ1029 / MV094 Love knocks and waits (Daniel Damon) Lovely words of assurance and a simple lilting melody. Lyrics and sheet music. VU769 God has blessed you forever and ever (Russian Orthodox) A lovely simple response to this Psalm. Can be sung with a responsive reading as set out in VU. Nice if you can build in the harmonies, but fine if you can't. *ATW 507 Where you tread (John Beavis) A beautiful and simple song based on the story of Ruth, it might be a good song to sing if you want to focus on the life-long relationship of Rebekah and Isaac. The melody is beautiful and very simple for a congregation to sing first time. We sang this once a couple of years ago, and it would be great to sing it again. MV085 / StJ / ELW814 / HPP319 / GtG698 / GC(II)692 / G(3)795 / SP130 / PfAS045B / URW441 / Lau395a / StF781 / LUYH741 Take O Take Me As I Am (Iona Community) A lovely simple chant. PfAS uses it as a refrain to a reading of the Psalm. ATA 184 Spring follows winter (love is the law) (Robin Mann) Lovely words to a familiar traditional English (?) melody. There is a Father in the last verse, but is inclusive other than that. Lyrics. Particularly good for the Southern Hemisphere, as it will almost be Spring. MV008 And on this path (Linnea Good) An energetic gospel style song. Here's a youtube video. We sing it much slower than this and as a gospel style song with big chords and a groovy bass part. I thought I'd never say that we sing something slower than anyone! MV108 I know your word (Tua Palavra). A simple Brazillian rhythm and a catchy tune. Great for kids, and a good song for adults too. “I know your word, your word is a lamp to my feet O God. I know your word is a lamp, O God, to light my path forever”. Good for kids. *Online Resource That's how we walk (Richard Bruxvoort-Colligan) This very simple chorus would be great to sing with kids, either during the service or in a Sunday School setting. Good for kids. Sheet music, sound sample and lyrics. *Online Resource We want to be close to your heart (Richard Bruxvoort-Colligan) This is another song that would be simple enough for the congregation to sing the first time they hear it. It's great for kids too. Good for kids. Sheet music, sound sample and lyrics. G(II)21 / GC22 / GC(II)17 / G(3)028 They Who Do Justice (David Haas) Simple cantor and response "They who do justice will live in the presence of God". Sound sample. Sheet music and lyrics. 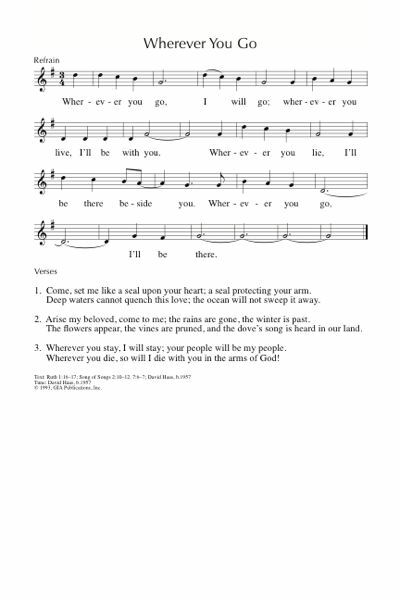 PfAS015A Lord who are they that may dwell (James Seddon) A hymnlike paraphrase of the Psalm. Fairly formal, but inclusive words. PfAS015B Lord who shall be welcome (Steven Warner) A nice contemporary sung paraphrase of the Psalm. Easy to sing. *CH008 Lord who may enter your house? (Whoever leads a blameless life) (John Bell) A lovely simple psalm response to a chanted or read paraphrase of the Psalm. Emergent Psalter Who may abide on your holy hill? (Isaac Everett) Simple response with read Psalm. Sheet music. TiS 5 Justice alone is the way of the Lord (S.T. Kimbrough / Carlton Young) Good cantor and response. Also in UMH Psalter. 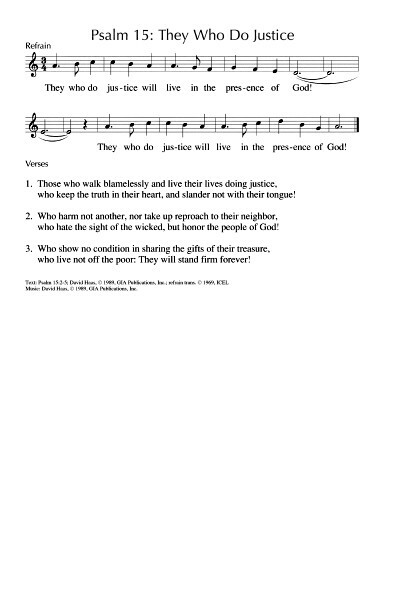 Cha729 Let justice roll down like the water (Lon Oliver) Responsive psalm with sung refrain. Good advice on living faithfully. Care for orphans and widows in their distress, and keep unstained by the world. *TiS 697 All the sleepy should have a place to sleep (Rusty Edwards) Great chorus "Make love happen by God's grace and by God's power. Let God move you on this day and in this hour. New creations will then blossom like a flower for together we can be the hands of God". We haven't sung it for a while, but it's probably worth singing again. *TiS 774 / GtG717 / W&R684 For the life that you have given (Carl Daw) Excellent words for the offering. If your congregation, like ours, doesn't have a song to sing when the offering is presented, it would be good to try singing this for a couple of weeks. It's short and meaningful, and the tune is a quite straightforward hymn tune. Lyrics & sheet music. ATOK 390 Put on love every day, never hide your love away (Mary Lou Walker) A fun song for kids! I confess that I suggest this whenever I cannot think of a better song for kids, because it's a lot of fun. Good for kids. TiS 643 / UMH206 / StJ / WoV649 / GtG377 / ELW815 / G(II)352 / GC508 / GC(II)513 / G(3)593 / W&R248 / 82Hml-490 / LUYH730 I want to walk as a child of the light (Kathleen Thomerson) Lyrics here. AoV1-034 Create in me O Lord a heart that is pure / I'll Sing Your Song (Erica Marshall) Good honest song. Simple to sing. Accompaniment sound sample and lyrics. TiS 712 / AoV2-021 / ATE 269 / The tide has turned songbook Create in us a clean heart O God (Digby Hannah) Good. A big favourite in our congregation. *AoV1-158 / GA438 Create a new heart Holy Lord / A new heart for a new world (Monica O'Brien / Trish Watts) Very simple melody, excellent words "Create a new heart Holy Lord, beckon our lives through your word, open our eyes to your call, United as one for your world". *AoV1-053 / AoVK-82 / GA256 Receive The Light of Christ (Erica Marshall) Simple round "Receive the light of Christ, May (it) shine within our hears, May the Christ Light fill us with joy and peace". Good for kids. Sound sample.